Facebook has quietly introduced its four-month-old organ donation feature to Asia, after the initiative — which allows users to sign up as organ donors via the social network — quietly went live in South Korea and Japan overnight. We suspected that this move would be forthcoming yesterday, after a Yonhap report revealed plans were afoot in Korea. Additionally, we speculated that the launch would not be isolated to just one country, and that proved correct as the feature is live for Facebook users in Japan too. The addition of these two new countries — which have more than 22 million users combined — means that the donor feature is now open to users in 13 countries, spanning North America, Europe, Africa and now Asia; although Pacific near-neighbours Australia and New Zealand were among the original bunch. What’s particularly noteworthy about the feature is that it designed to maximize Facebook’s viral effect. 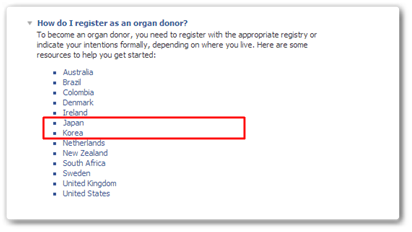 A user’s friends are automatically informed of their decision to become a donor once the button is clicked, and that has clear potential to encourage others to follow suit. With Facebook providing a link to a sign-up page, it is driving new registrations directly from users’ Timelines. That is a boost to the millions worldwide that are stuck on waiting lists seeking (often) life-dependent transplants. Facebook is launching the feature in Korea in partnership with the state-run Korea Centers for Disease Control and Prevention (CDC), and the organisation will hope that the arrival can have even just a fraction of the success that it has generated in the US and UK. The ‘life-saving’ initiative, as Facebook billed it, saw organ donor registration numbers jump by 800 percent in California just one day after going live. The effect was equally as significant in the UK, where the NHS saw its own figure more than triple overnight. As we said yesterday, the introduction of organ donations was seen as an overwhelmingly positive move from Facebook and, given the early results, it clearly indicates that the company remains a hugely influential medium, despite IPO woes and growing pains on mobile. Facebook is approaching one billion users and, should the organ donor feature extend to more countries, it is likely to have an even more profound influence, and perhaps set the tone for future welfare and social plans from the Menlo Park-based Internet giant.